There has been - over the last number of years - a continued drive to encourage each and every one of us to increase the amount of fruit and vegetables we eat. This intake - referred to as the 5-a-Day supplement - is designed to help you and your body stay healthy, fight off illness and prolong life expectancy. In recent years studies have shown that our predecessors; grandparents, great grandparents etc - had more opportunity to eat fruit and vegetables that today's generation. The reason for this: fast food and takeaways. All too often we opt for the easy way out instead of the healthy one which invariably leads us to order a takeaway or microwave a ready meal for lunch or dinner. What Is My Five-A-Day Quota? This is a question that has stumped many people; we are told that we should eat five portions of fruit and vegetables per day but many do not know to what extent this should range. It is important to note at this point that it does not necessarily have to be fresh fruit or vegetables. Pre-packed or canned will do just as well and continue pretty much the same levels of vitamins required. This is a distinct advantage for families living on a tight weekly or monthly food budget. All fruit and veg can be used as part of your five a day quota with the exception of potatoes; potatoes are high in starch content which can issues with digestion and with the heart itself. Many people shy away from their five-a-day quota because they think they have to eat the vegetables raw; this is not the case. The vegetables - and the fruit too for that matter - can be used to prepare delicious meals that are high in the nutrients and vitamins required from your five a day quota without sacrificing taste. That said if you are one of the growing number of people who eats their fruit and vegetables in their raw state this is no bad thing. We know that we cannot eat too much of one thing and not enough of another and this is very true of fibre. Fibre is what our body requires in order for us to process our food internally and expel the waste materials. Too little fibre can lead to bowel problems such as constipation and bloating while too much fibre can lead to diarrhoea, dehydration and even haemorrhoids. Fruit and veg are good providers of fibre but it is important to eat them wisely and in manageable portions. Also it is important that when you do eat them you do so whilst relaxing. All too often we bombard our digestive systems with mouthfuls of food while we are on the move which leads to cramps, indigestion, heartburn, acid reflux and potentially problems with the bowels. 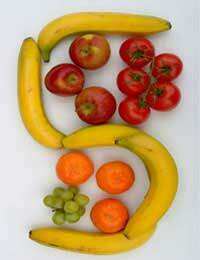 With this in mind it is important to eat as much of your five a day quota as you can without completely eradicating all other foods from your diet. If you are in any doubt the Department of Health have guidelines and menu ideas on their websites or alternatively a visit to your doctor to ask about dietary intake is worth while.